Picture from group : Maulin from the West. Picture: Maulin from the West. A reasonably easy objective which can be a good start to many a circuit. 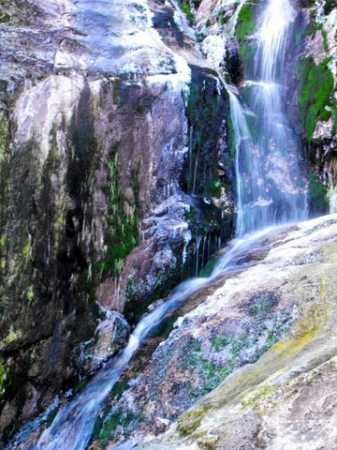 Maulin has earned the high rate of visits it has through various attractions. It's very accessible from the Crone Wood carpark, itself relatively near Dublin. 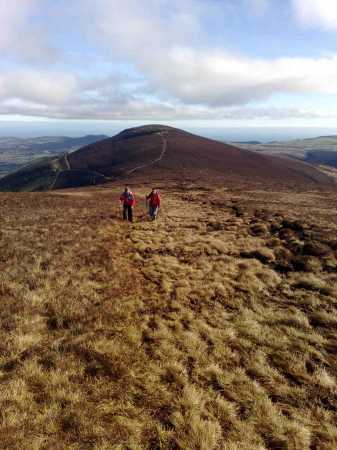 It can be a component of many circular walks for example around the Dargle River valley and because it has fine views including towards the sea and the mountains. An obvious place to start to reach it is from Crone Wood Carpark O1920 1417 A from which the summit is 1.3km in a SW direction. Navigating to the top from the carpark can be done by two main switchback routes through the trees. One of these is shown on the current OSI sheet 56 and both are shown on the East-West 1:30000 map. It is also possible to park in the vicinity of the closed car park near O210 219 B on "Long Hill" and take a path following the edge of the forest first up, then down and finally onto the ridge to the east of Maulin. (14/08/04) Having made a successful attempt at Ben Nevis on the 01/08/04, with clear views, in warm sunny weather all the way to the top and down again, and I was able to see the splendour of the Scottish Highlands and lochs below me - which was a nice change from my 2 previous failed attempts as unforecasted thunder, lighning, gales and blizzards descended from nowhere! Hence I turned back to the relative safety of my car! On my return for my bi weekly walk in the hills, I wanted something a) close to home b) not that demanding and c) I hadn't climbed before - with the excellent comments about this mountain on your site - Maulin was chosen! I parked in Crone Forest car park - loads of space 100 cars + maybe? Followed Wicklow Way (WW) up through the forest and more or less followed csd's route to the top. The path seems to have had recent work on it, with a path marked out to reduce / minimise erosion with a few signs indicating to walkers to please stay within the path boundary. I found csd's wall - can't really miss it, and followed down a sharp descent to a wider path turning right and contouring below the shoulder already climbed. As this path curves right and begins to rise, there is a wooden stile and gate which leads in to the forest on your left and down a ride - I presume this was csd's way too! Again this is quite a steep descent, an old wall to your left, some felling on your right. At bottom of this path, I turned left and almost immediately right on to what could only be described as a not overly used mountain bike trail which wound its way down hill through the trees, crossing a wall a few times until you have a clear descent along the top of the wall, which ends back on the WW, turn left and head for home!! I wore shorts and didn't need my gaiters which I had stowed in my backpack having read previous comments, but boots are essential! A wonderful walk, it took me approx 3 hours but then I did have a few stops to admire the scenery, take on water and have a munch which is why I walk in the mountains anyway!! Excellent summit walk ... a fine sunny day. As we headed for Crone Wood at 9.15am, there was drizzle and low cloud at Glencree junction. 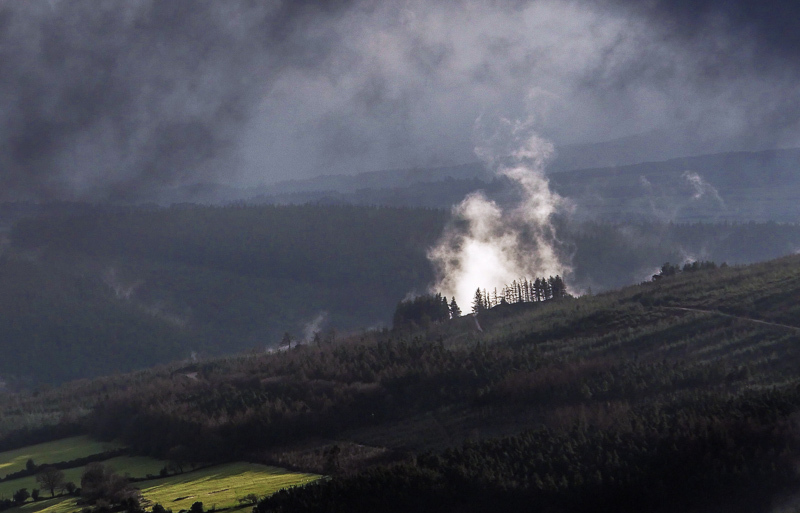 Head up from the Crone carpark (NOTE – barrier closes 4pm) and break from the Wicklow Way early on 19232 13780 C to head west south west following the White Route circular markers on the pine trees up along the forest track. You will eventually arrive at a stile O18185 13288 D leading on to the north face of Maulin. The drizzle had stopped and clouds dispersed. Take a little time here, if the weather is good, to admire the magnificent views down into Lackandarragh and the valley of the Glencree River as well as right up to the Glencree Reconciliation Centre nestling at the head of the glen. Turn left straight after the stile and you will see a well defined track to your right O 18232 13265 E leading straight up to the cairn on the summit. This track is slightly worn and can be slippery. Proper walking boots are essential on the rougher tracks to protect your feet and ankles. If you are blessed with good weather, like yesterday, the 360 degree views from the summit are spectacular. Well worth the effort. 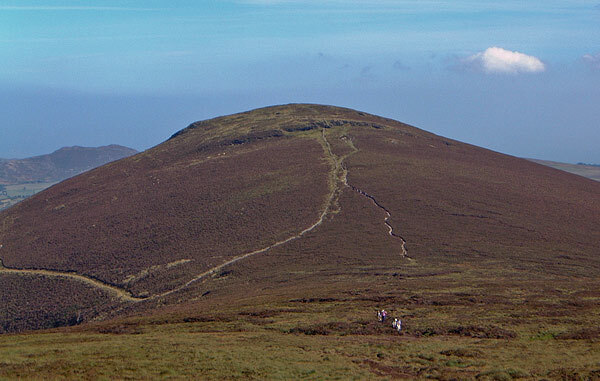 Picture from simon3 : Maulin from the slopes of Prince William's seat. 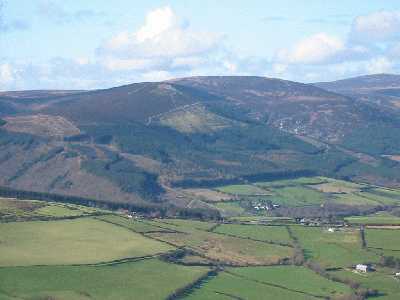 Picture: Maulin from the slopes of Prince William's seat.